If your company requires employees to travel frequently, a well-crafted corporate travel policy protects your company’s bottom line. It reduces unnecessary expenses and limits the amount of legal liabilities that could threaten your business. Whether you’re creating it independently, or getting help from a corporate travel agency, your policy should be organized and employee friendly. Here’s a step-by-step guide to draft a crystal-clear corporate travel policy. Every trip should start with a request for approval. Make it clear to the employee reserving the trip that he or she needs to provide very specific details to get approved. Be sure you have a process in place that enables a written or digital record of the trip’s authorization. This “receipt” systemizes the process and eliminates hearsay later. Employees need to know that plans can only be confirmed by an authorized individual who is at least one management level above them. Once, and only when, the trip is approved, the traveler can move forward with finalizing accommodations. Having a record of and specifying the company’s lodging options reduces company liability. Once the trip has been confirmed, travelers should book according to your list of approved vendors. They’ll need to keep track of the hotels, events, rental vehicles, and meals they’ve reserved. A list of approved vendors is not intended to police your travelers, but to ensure reimbursements post-trip. It will also help the company make better decisions for future reservations. Employees should feel empowered, not restricted, to leverage frequent flier miles, loyalty rewards, and membership discounts. Keeping track of every transaction during a trip is necessary for your travelers to get reimbursed. Your policy should clearly state what forms of receipt are acceptable, such as bank statements or a company-approved log sheets. In addition to transaction documentation, also clarify the types of transactions that can be reimbursed. Some commonly compensated line items include airline baggage fees, airport taxi or shuttles, car rentals, and currency conversion fees. This is also a great place to state the types of airline seats an employee can book if they want to be paid back. If you want to avoid employee frustration later, make a clear list of items that will not be reimbursed post-trip. Payment for things like alcoholic beverages, animal boarding, car repairs, child care, flight insurance, or spouse/companion expenses typically do not qualify as reimbursable transactions. 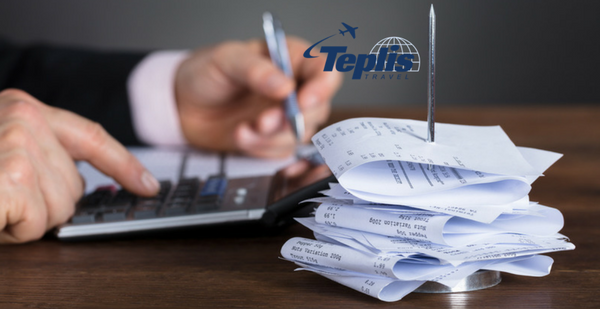 If this seems too overwhelming, partner with a corporate travel agency like Teplis Travel to craft a highly efficient policy that makes travel streamlined and profitable. If you’re looking to strengthen your policy, call Teplis today at 800-669-6547 to speak with an experienced representative about a corporate solution that’s right for you. We combine the guaranteed lowest fares with highly customized service platforms to suit the needs of any business traveler.